1st Choice Stadium Storage is located on Ira E. Woods Avenue near Café Italia and the Grapevine-Colleyville Stadium. We’re less than a mile west of the intersection of Highway 114 and Highway 26 near Dallas/Fort Worth International Airport. Residents and businesses from Southlake, Westlake, Trophy Club, Colleyville, Coppell and Bedford are all just a short drive away! Call us today to speak with one of our friendly self storage professionals about our deals. Discounts available for long term and multi-unit customers and we offer great move-in specials. Pay prorated rent on move-in, 2nd month free. 1st Choice Stadium Storage will be on your right. Office is located behind 121 Community Church. Convenient and affordable are just a couple of words our customers use to describe our great features and low-cost options. We offer a variety of features and amenities that take your storage experience to the next level. Need boat or RV storage near Grapevine Lake? We're just minutes away on the south side of the lake. Between our first floor indoor climate-controlled units and our covered and uncovered parking spaces, we can accommodate nearly any storage need. Businesses, students and residents alike appreciate our ground-floor, drive-up accessible units. We even have dollies and handcarts on hand to make your move-in as painless as possible! Stop by any day of the week for a tour of our spacious storage facility! Our office is open from 9 a.m. to 6 p.m. Monday through Saturday and from 10:00 a.m. to 5 p.m. on Sunday. For the safety of your belongings, our facility is equipped with tall perimeter fencing, controlled gate access and 24-hour surveillance cameras, as well as the watchful eye of our resident manager. 1. Are there moving trucks available to use? Our facility does offer rental trucks. Call and also ask about how to use our truck free of charge during move-in. 2. What kind of documentation do I need to rent a unit? 3. What kind of documentation do I need if I am storing a boat or vehicle? A valid driver’s license or federal ID with picture is required to lease a unit. To store the vehicle we will need some information on the vehicle such as make, model, VIN #, License Plate # and expiration, and the insurance provider and policy #. 4. What kind of documentation do I need if to rent your trucks? A valid driver’s license for all drivers and a copy of your current insurance card to verify insurance. 5. Is there a deposit required to rent your trucks? We require a $100 deposit from our storage customers that is refunded immediately upon returning the truck. Non-storage customers also must provide a deposit that is based on the estimated cost and mileage of your rental. 6. Can I buy boxes and other packing products from 1st Choice Stadium Storage? Yes. 1st Choice Stadium Storage offers a wide variety of boxes and packing supplies. Check the Boxes and Moving Supplies page for more information. 7. How long will it take to complete my transaction on move-in day? 8. What does "on-site" manager mean? "On-site" manager means that an employee, usually the Store Manager, has an apartment on-site as part of the facility. 9. Do you have video cameras? Yes. 1st Choice Stadium Storage uses video cameras as a security measure. Cameras are generally located at the point of entry and exit and other areas around the facility that cover the entire property. Our comprehensive security measures include 24-hour color surveillance cameras with night-vision that are digitally recorded, automatic lighting in all hallways, and additional outdoor lighting in public access areas. 10. Can anybody drive onto this property or do you need a PIN number? 1st Choice Stadium Storage has an electronic gate system, which can only be opened by a security code that is assigned to each individual tenant. The code allows us to monitor who is entering and exiting the facility. All entries are recorded and logged so that our on-site managers know who has visited the facility. 11. Do you have your own movers? While we do not offer moving services, we do have a company that we often refer to. There are also a variety of movers available in our area. Check the yellow pages under the heading "movers" for a complete list. 12. What is climate control? Climate control is a feature that we offer. This feature helps protect your stored belongings from the extreme temperatures. Climate Controlled Storage is kept at a temperature between 50 to 80 degrees year-round by using air conditioning or heating, depending on the time of the year. Each space has an air duct to ensure the unit is maintained at the correct temperature. Interior Units allow you the possibility to access and organize your belongings without ever dealing with the outside elements. All of our Climate Controlled units are on the first floor. 13. Do I get a lock when I rent a unit? You can purchase a new lock at 1st Choice Stadium Storage. We recommend disc locks to ensure the highest level of security. 14. Do you offer RV/boat/car/motorcycle parking? 1st Choice Stadium Storage offers parking for RVs, boats, cars, trailers and motorcycles. 15. What is a drive-up unit? A drive-up unit is an outside unit, located on the first floor of a facility, which gives you the ability to load your belongings directly from a vehicle or truck. 16. What's the difference between office hours and gate hours? The office hours are the hours of operation for the property. During these hours the Store Manager will be available to assist you with your storage needs or moving and packing supplies. The gate hours are the hours of the property, and when your unit can be accessed. 17. What kind of security do you have? 1st Choice Stadium Storage takes great pride in protecting your belongings and strives to provide state-of-the-art security. We feature electronic gate with coded access, monitored video surveillance, fenced and well-lit facilities, and personal locks available for purchase. 1st Choice Stadium Storage strives to make your storage experience as seamless as possible, including paying your bill. Typically, our leases are month-to-month but we also offer the flexibility of long-term leases. We offer AutoPay or send monthly invoices. We can automatically charge your MasterCard, Visa, Discover, or American Express each month. 19. Do you accept credit cards? We accept several different major credit cards, including MasterCard, Visa, Discover, or American Express. 20. What sizes are available and how do I pick my size? We offer a wide range of sizes to accommodate your needs. Sizes range from 5x5, or 25 square feet, to 12x30, or 360 square feet. Determining the right size is easy with the help of our Store Managers who are trained to assist you in this process. We are just around the corner from Southlake TX! 1st Choice Stadium Storage. Southlake need extra space, business records storage, a mini warehouse, medical records archiving? 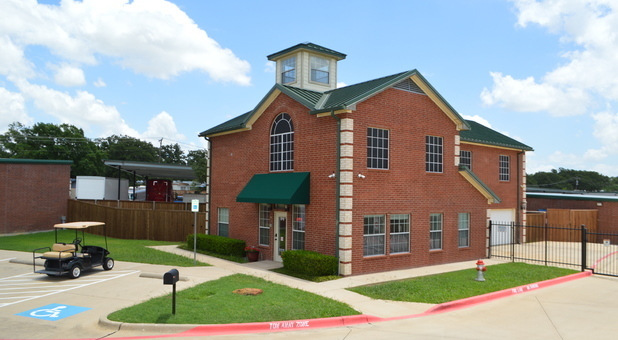 We are Convenient to Southlake and have self storage units for all your residential or corporate needs. RV and boat storage Southlake, Texas (TX). The suburb of Southlake is quickly growing into one of the premier cities to live in for families in North Texas. The 1st Choice Storage facility has been architecturally designed to blend into the neighborhood feel of the city of Southlake. In addition to serving the Southlake residents, 1st Choice Storage also serves many Southlake businesses, from landscapers, to engineering firms to law firms in the area. 1st Choice Storage also sponsors the Southlake Dragons’ Booster club which serves the city of Southlake’s High School sports teams at Carroll High School and Carroll Sr. High School.